So today we took a trip to the wealthy suburb of Morumbi, once a rainforest outside Sau Paulo and now home to seemingly endless roads of gated mansions patrolled by security guards. Tinted windowed 4x4's and taxi cabs drive up and down its hilly streets while the only people on the pavement seem to be domestic staff trudging to work. And the occasional prostitute, doing the same I guess. 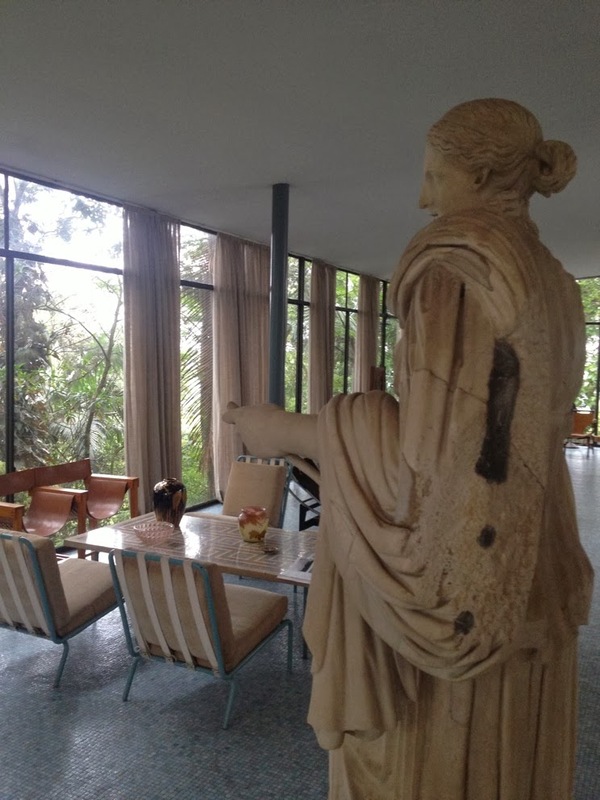 Somewhere in these hills hovers Lina Bo Badi's Casa de Vidro, the remarkabl house the Italian-born architect designed for her and her husband and their seven cats in the early 1950s. You approach it up a steep and winding driveway which makes a 90 degree turn at the end to bring you up to, or more accurately, under the house. The living room floats amongst the trees above you, perched on some fabulously skinny columns and sandwiched between two thin slabs of white concrete. 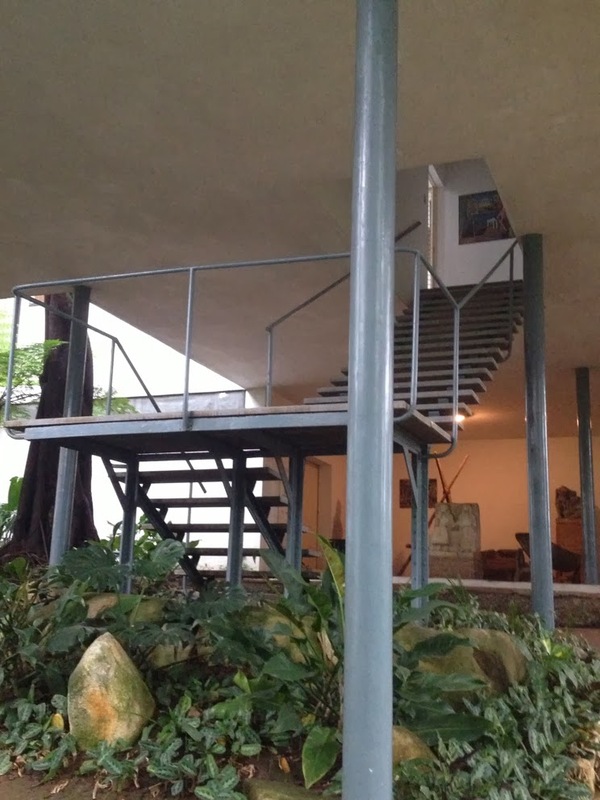 The drive carries on under this structure where a stair takes you up to a lobby that is both inside and outside the house. You haven't actually gone through a door but this slot like space is coded as interior by the placement of an abstract painting hanging on the wall in front of you. You enter from below basically, like a tree house, and emerge into the large, glazed living space with its random and very beautiful collection of furniture, paintings and artefacts. You can walk up to the skinny black frames of the floor to ceiling glass walls and get an intense, vertiginous rush as you gaze out through the trees at the vast city beyond. 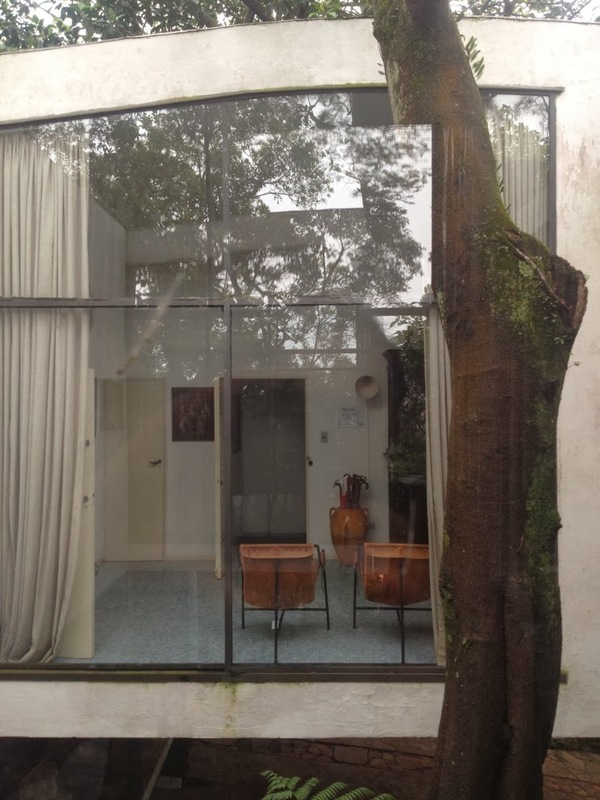 In the middle of the space is a hole, a kind of vertical courtyard through which a tree grows and which allows glimpses of the corridor to the bedrooms behind. The bedrooms and bathrooms sit at the back of the house, small and dimly lit in comparison to the expansive and spatially undefined living room. But they have a care and meticulousness about their arrangement and detailing. 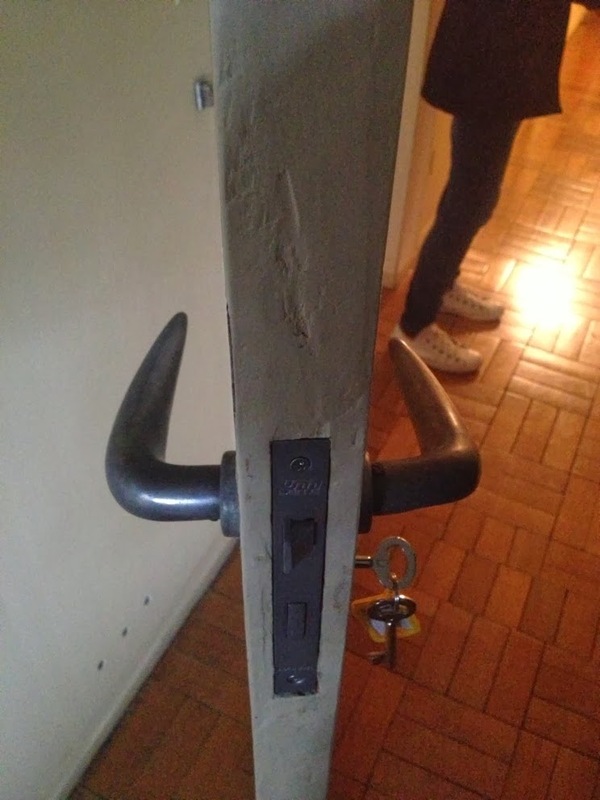 The door handles for instance are beautiful and surreal, reminiscent - as one of my companions Damon Rich pointed out - of a pair of bulls horns when you can see both sides of the door. The two wings of the house - the glazed, floating front and the more traditional, ground hugging back - are linked by a vast kitchen of impressive modernity for its time. The Bo Bardis it seems, liked to host parties and it's hard to imagine a more spectacular and glamorous setting for them. 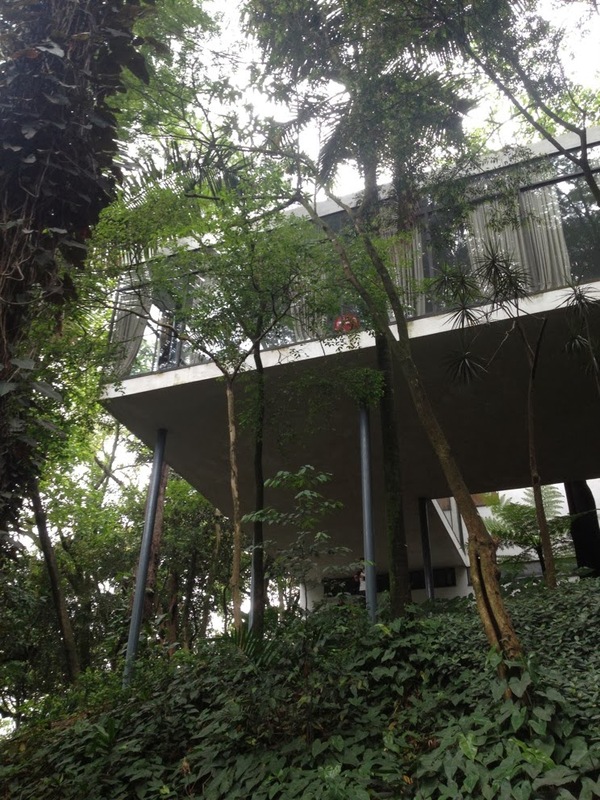 Brazilian modernism of the 50's and 60's aspired to a level of spatial fluidity and gravity defying structure that makes European brutalism seem pretty tame by comparisonb. Flying canopies, vertiginous ramps, tilted floor planes and highly ambiguous definitions of inside and outside, make them thrillingly disorientating experiences. Bo Bardi's house takes the domestic entrance sequence and turns it into a spiralling and disjunctive vertical journey. The stairs are outside, the hallway is in an undercroft and there is a tree growing in the living room. As you leave, the house seems to just float away above you, hanging in the trees.